The first TRULY RESPONSIVE solution for saving time, money and water! It’s 6 am. You step into the bathroom, shivering as you start to brush your teeth. Then you quickly get undressed and jump into a steaming hot shower. You put your head under the water and sigh. You didn’t have to let it warm up… your perfectly hot shower is ready for you in 30 seconds or less, any time you need it. That’s how simple every morning should be. That’s why there are so many other companies out there promising to deliver this kind of comfort – and water savings – to their customers. The typical house sends something like 17.3% of their water straight to the sewage treatment plant, every day, while they’re waiting for the shower to heat up. The WaterQuick Pro II saves nearly all of that water by pushing the cold water in your line back to the water heater so that when you open your faucet – all you get is the relaxing warmth of hot water, every time. You save time, money and – best of all – around 10,000 gallons of water, one of our most precious resources… without burning any extra gas. It doesn’t matter where you are in your house – you this technology gives you hot water on demand without pushing any buttons or looking for a remote controller. Then just turn on your shower and wait about 5 – 10 seconds and jump right in. That’s how much easier… and more comfortable… our Faucet Activation Switch Technology has just made your morning routine. You don’t have to change how you live your life or tell your guests to follow any extra steps. It’s there, whenever you need it… saving you water, not burning any extra fuel, and cutting the typical 1-2 minute-wait for hot water down to about 30 seconds. This is the kind of convenience you would expect if you were staying in a deluxe suite at a 5 star hotel. But now, this technology is available for your home! Mark, just wanted you to know the pump is working great and our customers are pleased. The system is great and the pump starts and brings hot water to the faucets after momentarily turning on the hot water as advertised. To me it’s genius in its simplicity. It works without having to run return lines or add motion sensors. I’m Mark Franklin, the inventor of the WaterQuick Pro II™ recirculation pump system. 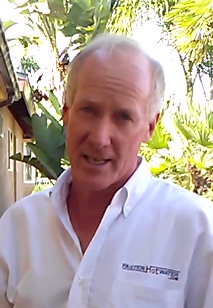 I owned one of the fastest growing civil engineering businesses in San Diego for 15 years. The key to our success was technology. We were the first office to use AutoCAD, allowing us to take on over $150 million dollars’ worth of projects, even with our small staff, because we could work faster than all the offices still stuck on using drafting boards. In the early 90s, I started another company on the side dedicated to getting current water saving technologies out into the public. We sold over 15,000 low flush toilets to houses and apartment complexes. According to estimates, we’re still saving tens of millions of gallons of water, ever year, because of that work. So it’s safe to say that I’ve been passionate about saving water in San Diego for nearly 20 years, and I’ve always believed in the power of technology to improve lives. However, it wasn’t until hotels like the Marriott, Hilton Garden Inn, Staybridge and the Builtmore called me to solve their hot water problems that I was able to develop a new, more responsive kind of circulation pump. This is the same core technology that, scaled down, can now offer you a much higher level of comfort at home, while also saving you tons of water – without spending any more on natural gas. This idea held so much potential that it actually became the subject a million dollar research study commissioned by the California Energy Commission and conducted at the Laurence Berkley laboratories. Later a $580,000 rebate fund was established by the Southern California Gas Company for apartment buildings that would adopt this technology. They saw how this could change the way to reduce energy demands. I saw that this is the way the industry needs to go. The Quick Water Pro II™ brings you steaming hot showers, ready at a moment’s notice. It also cuts your bills and takes a huge chunk out of our water demand. Works with any kind of plumbing system, even if you have multiple dead end lines. Works with traditional tank style water heaters or tankless. With 3 speeds, it provides optimum performance for any size house. It installs out of the way so it doesn’t take up valuable storage space. It doesn’t increase your gas bill and only uses about $4 of electricity a year. Very quiet. It purrs softly like a cat. Built tough. Stainless steel construction. Installs under your sink in about 5 minutes. 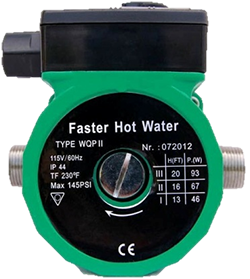 Contains a heat sensitive valve that shuts off when the water reaches 95 degrees, stopping the pump. If your house has 2 dead end hot water lines, simply install one more in-expensive bridge valve. Doesn’t take up any space. Note: You’ll need to purchase the parts below separately as we can’t be sure what you need for your specific plumbing set up. Other products want you to install an electrical outlet below you sink. That takes time and money, (and in every State in the US – a permit). But what if you don’t have a convenient power line near your sink?.. Then it looks like you have to call the electrician… and if you have more than 1 hot water line in your house… you’ll have to buy an extra pump! On top of that, they want you to drill a hole in your bathroom cabinet to install the “on” button or go buy an X-10 transmitter and receiver if you actually want hot water on demand in another bathroom in the house. It seems they’ve conveniently left these facts off on their packaging. The WaterQuick Pro II™ design has eliminated all of those design flaws. It goes were plumbing things should go – in the garage next to the water heater where there are usually plenty of electrical outlets. It works with any kind of plumbing system: traditional tank style heaters, tankless and even houses with dedicated recirculation systems. It’s easy to put in. There’s no need to solder any pipes. Just push the connections together using “Shark bite™” fittings. And in most cases you can install the entire system in about an hour. The only tools you’ll need are: a pipe cutter, a crescent wrench, some emery cloth, a little bit of plumber’s tape and some pipe dope. Everything snaps into place and it’s ready to go. Every house is different. But you’re not going to have to worry about that. If you run into any problems with your instillation, just give me a call and I’ll personally walk you through it. We even have a video series that gives you clear, step by step instructions. Once you how easy this is, there’ll be nothing holding you back. But if you hit a snag, you’re always free to give me a call. Take advantage of my 35 years of engineering experience. I’m positive that I can solve whatever plumbing situation you throw at me. I’m all ears. Call my cell phone at (619) 665 – 2077 from 7am – 7pm, 7 days a week, and you’ll be enjoying faster hot water in your home before you know it. Providing people with a better alternative to the way things were done before is exactly what the WaterQuick Pro II™ is all about. I know that if manufacturers provide an alternative that is too expensive or unreliable, nobody’s going to pay much attention. That’s why I’ve worked hard to create the perfect balance between price, durability and usability. You might’ve seen other re-circulation pumps at Lowes® or Home Depot® that look similar to the WaterQuick Pro II™. And, just at face value, it seems like they can get the same job done, even if you have to push a button or put yourself on a hot water schedule. But when you look a little closer you’ll find that they’re filled the hidden installation and operation costs. That’s the dirty secret that they don’t want you to know – but I do. If you’re looking for something easy to install, easy to use and economical… The WaterQuick Pro II™ wins hands down. We are also extremely competitive – even if you are only looking at the total end of the year costs. But let’s look at all that you get for that difference. It doesn’t take up your storage space under the sink. It’s very quiet, and it’s out of the way. I’ll personally help you overcome any instillation problems. The F.A.S.T system makes it the easiest operation, from anywhere in the house. You don’t have to put your showers on a schedule. One more thing to note, if your house has more than one dead end hot water line then with the “Under the sink” type of recirculation systems, you will need to buy 2 units to service your entire house. That would also mean that you have to install 2 new electrical outlets. Many of the major re-circulation pumps out there can only save you water by wasting fuel. Normally I don’t call people out like this, but on this point I think I have to. It’s unfair to take advantage of the term “green technology” just so someone can sell a product. Because really, using $30 – $40 dollars of natural gas a month is no small matter. You’re not going to reset your timer every time that your schedule changes. But you will have to pay $360 – $480 dollars a year just to keep recirculating hot water around your house – even when you’re not using it. So even though there is a very low entry price on many of these models at major home furnishing stores, it’s doubtful that they are ever going to pay for themselves. At best, you could call this a “grey technology”, liabilities to homeowners instead of an asset. Because until we pass the tipping point where the savings outweigh the costs, this technology will still be seen as an optional luxury instead of a commonsense convenience. The real meaning of green is to motivate people to convert to better technologies which provide a higher level of convenience at the same time that they reduce the consumption of all natural resources. The WaterQuick Pro II™ is here to do just that. By providing the perfect balance of price, quality, and user experience, we are showing people that comfort and conservation can go hand in hand. We are offering a better alternative. We are leading by example. Start saving more than 10,000 gallons of water a year. Cut the time that you spends just standing there waiting for the shower, as much as 12 hours a year. Reduce your water bills by an average of $270, or 17.3%, a year. If that means that you can drop down a tier in your water and sewer fees, you save an additional $225. It pays for itself in under 2 years. And, comes with a 3 year manufactures warranty. So you’ve got nothing to lose! Changing the way that people use water – and saving money. P.S. 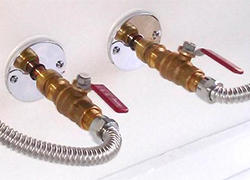 For houses with tankless hot water heaters, we’ve got you covered! The WaterQuick Pro II™ is the only pump on the market that works with tankless style water heaters. And, it even helps you save more water than it would with tank style heaters. You see, tankless water heaters cycle the cold water through the heater a few times as a safety measure. This means that you have to wait longer as the water is running down the drain. The WaterQuick Pro II™ makes sure that none of that water is wasted – while you get faster hot water. 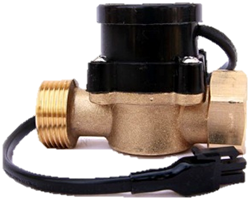 Standard bridge valve works for most homes and connects the hot and cold water supply lines under the most remote kitchen or bath fixture in the house. *Upgrade to The Advanced Bridge Valve kit and receive 2 custom supply lines with 7/16″ openings. All for $387.00. Includes free shipping. All the pieces add up to provide your family with a higher level of comfort and convenience at the same time that you save water (and your money) from going down the drain. I’m hard pressed to think of a reason why you wouldn’t want one of these in your home. As I said earlier, it even pays for itself in under 2 years! Yes! I want to give my home the convenience and comfort of hot water on demand, all while cutting my water bills - as soon as this weekend. Although water rates are going up all over the country, I’m relieved to know that I’ll be spending less because I’ll have the luxury solution that saves enough water – without burning any extra gas or running up my electrical bill - to actually pay for itself in under 2 years. I’m satisfied to know that your unique Faucet Activation Smart Technology means I’ll have faster hot water in every bathroom and at every sink AND that 1 pump is enough to serve my whole house, no matter how big it is or how many plumbing branches I have – all without having to install any new electrical outlets. I know that whether I have a traditional tank style water heater, a newer tankless style water heater or a dedicated recirculation system (with 1 more add on component – at no extra charge), this is the recirculation pump for me. And so I’m ready to roll up my sleeves and – armed with a few basic tools – have all the convenience, comfort (and savings!) of The WaterQuick Pro II up and running in about an hour. 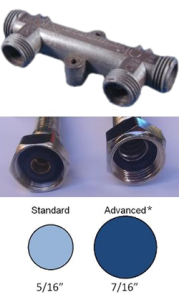 I realize that because every plumbing set up is different I’ll still have to buy supply lines and Sharkbite™ fittings separately. But I know - if I just send you a few pictures of the top of my water heater, you’ll tell me exactly what I need, saving me time and hassle at the hardware store. Not only that, with your installation videos and a direct line to the inventor himself – who will gladly walk me step by step through the entire process - I’m confident that there’s no plumbing situation that can stop me. Once set up, I’m glad to know that I won’t have to perform any maintenance or ever have it serviced. I’ve got better things to do. Still, I know that in some parts of the country the water quality has a corrosive effect on any device. But I’m not worried about that either. 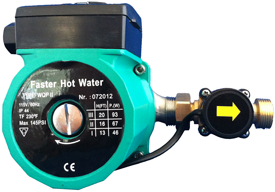 In the event that The WaterQuick Pro II stops working, I’ll just send it back for a free repair and I’ll have faster hot water back in my house, working hard – to save me time, money and water - ASAP. I won’t pay another over-inflated water bill. Send me the PREMIER WaterQuick Pro II immediately! The Advanced Home Conversion Kit include everything you need to get hot water wherever you need it in the house 30% faster than our regular system. If your house has more than one home run (dead end line) extra Bridge Valve(s) may be required. Do you have a tank or tankless system? “It means a lot to me to save water, especially in San Diego where it’s scarce. The WaterQuick Pro II™ not only gives me hot water when I need it, but more importantly it helps save the environment as well as saving me money and… I just love having it. Before I put it in I would go turn on the shower and go to take my clothes off… and, you know, probably end up wasting hot water while it was there at the tap. Verses now, I turn on the water when I start to brush my hair. I turn it off. And then when I’m ready to get into the shower, it’s on. So I save not only the cold water that went down the drain but I also save the hot water that I was probably wasting. But, I don’t know when I’m going to take my shower. I don’t know when I’m going to do the dishes. So it didn’t really meet my needs. Plus, the lowest increments were 15 minutes, which is a lot of time to keep the pump running. This one only runs until the sensor tells it it’s hot and then it shuts off… which is like a minute. It is more expensive than the one I originally bought from Home Depot, but it’s a significantly better product. So I don’t think the price is that high because I don’t think the first one’s better. I think it’s certainly very appropriately priced. – Margaret M. – San Diego. © Copyright - NSM Worldwide 2014 - 2019 All rights reserved.